Hand & Nail Harmony recently hosted the PhD Select Training at its headquarters in Brea, CA. The training, which included attendees from all over the globe, was open to technicians who already completed the Harmony PhD Program and tested through to the next level. Instructors included top educators and Deans of Education MaeLing Parrish (USA), Antonio Sacripante (Italy), Nayet Hamila-Strand (Sweden), Antony Buckley (UK) and Ghenna Gonzalez (Mexico). During the 3-day training, the classes reviewed product knowledge, nail critiqing and perfecting of application. Additional topics included hands-on pink and white Gelish Hard Gel applications with nail bed extensions, hands-on natural tip with Gelish Structure Gel Overlay and French Gelish and acrylic nail design. The attendees were treated to a special sneak peak of ProHesion, the new liquid and powder launch from Hand & Nail Harmony - which will be available May 2014. The sneak peek also included hands on work, which included sculptured pink and white competition-style with nail bed extension, the stiletto nail design and use of color and contrast. 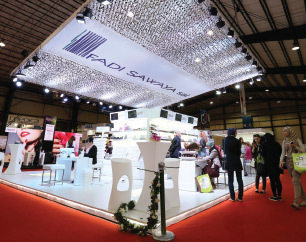 Fadi Sawaya SAL, Middle East distributor of Gelish and Morgan Taylor Nail Lacquer, exhibited the brands with a beautiful booth and attractive displays at the In Shape Health, Beauty and Fitness fair held at the BIEL in Beirut, Lebanon on March 7 to 10. The InShape exhibition is known to be the mirror of the Middle East, and showcases all the newest and most up-to-date fashion and beauty trends in the region. The booth also included international educators that flew in from Europe and the United States to provide on-the-spot demonstrations: Rebecca Lal and Anneke Van Der Sar helped highlight the amazing quality and easy use of the products. The event was a huge success and proved that Gelish and Morgan Taylor are the industry leaders in the professional beauty market. In October 2013, Nail Harmony UK launched the Gelish Gives Back competition to give 10 girls between the ages of 16 and 25 the opportunity to win the chance to attend a Nail Harmony/Gelish course. After sifting through hundreds of applications, Nail Harmony UK finally decided on the lucky winners. The girls won a 3-day beginners' Gelish course that the students attended over 3 consecutive weeks. Six of the winners attended from the South of England and 5 winners from North England. The lucky winners also received a full Gelish kit that included a 18G LED light and a range of colors. All of the students showed huge potential and really impressed Head of Education for Nail Harmony Jan Soar, who held the training. With the "Gelish Gives Back" initiative, Nail Harmony UK continues to be committed to spreading awareness in regards to the importance of training and education. Held on March 9th and 10th at the RDS Simmonscourt in Dublin, Ireland, the Irish Beauty Trade Show featured a beautiful booth that hosted both Gelish and Morgan Taylor, and a very special guest: Miss Ireland Aoife Walsh. The red-headed beauty joined the Nail Harmony Ireland team to have Gelish Hard Gel and Gelish applied to her nails. In other news, the biggest Irish Soap Opera "Fair City" will be setting up a dedicated nail bar added to their show. The official sponsors? Gelish & Morgan Taylor! Nail Harmony Poland distributor Euro Fashion continuously works to organize different ways to promote both the Gelish and Morgan Taylor brands; whether it's product presentations, fashion shows, trade shows or educational workshops, they are always making sure that both brands are in the forefront at all events. 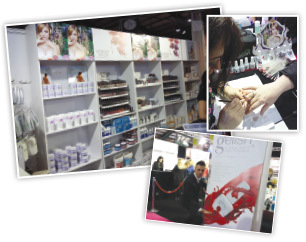 They recently participated in the biggest trade show in the region, the Beauty Forum show in Warsaw, Poland. With more than 10,000 visitors and 243 exhibitors, this is one the largest and most important trade show for professionals in Poland. Nail Harmony Poland also hosted an event for International Women's Day, where free Morgan Taylor manicures and gift bags were provided for all the female attendees. 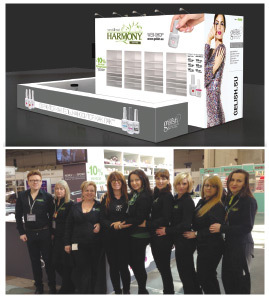 Nail Harmony Ukraine presented its new show booth at Estet Beauty Expo that was held in Kiev in the middle of March. The new booth turned out to be a great success, with its pure white background, beautifully stocked Gelish and Hand & Nail Harmony products and bright lights. At the Estet Beauty Expo, Nail Harmony Ukraine also hosted seminars and training by Harmony's educators Nataliia Baranovska, Krasimira Petrova-Krumova and Gala Starenko. The Nail Harmony Ukraine team showed the perfect example of how the nation's nail market should be: with professional products, exceptional management, thorough marketing and through-the-roof sales! 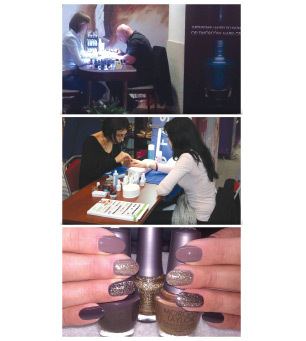 The Nail Harmony Central Europe team has been traveling and teaching! Led by Dean of Education Krasimira Petrova-Krumova, the team traveled recently to Ebilsi, Georgia and Slovenia to educate and introduce nail technicians in the region to Nail Harmony products. Petrova Kramova was most grateful for all the attendees who came out and showed their upmost dedication and interest in the brand. A total of 70 attendees showed up to the Ebilsi, Georgia training - which was a huge success!